Make a round cake the size that you need. 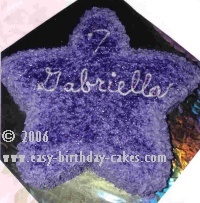 With an icing filled bag and round tip, size #5, draw a star on the top of the cake. Make icing in the child’s favorite color. 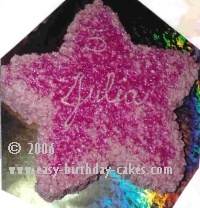 Using star tip, size #18, cover the entire cake. The two cakes I made were pink and purple. Next, sprinkle pink edible glitter on the pink one and purple edible glitter on the other one. Next, with white icing and round tip, size #5, write your message on the cake top or on the board whichever you prefer.